Considering this mobile phone's screen size (5.2 inches), its weight is reasonable. Light touch or a complete overhaul is a likely dilemma when upgrading a flagship. Users have been seeing more of the former recently while clearly hoping for the latter. Now, that's the real dilemma most manufacturers have to deal with. Customers are increasingly harder to please at a stage when the technology simply isn't evolving as fast as it used to. Or the benefits of evolution are not making as big of a difference. Beautiful design and waterproof features. All the icons just look way too big. While it may have a 20.7-megapixel camera, auto-focus can be a little off, but nothing a quick tap on the screen can't fix. really its a massive cellphone,, everything is too good in it. Beauty And The Beast In Performance!! 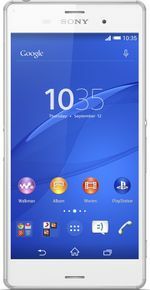 the sony xperia Z3 is a beautifully designed smartphone,from inside as well as from outside! Powerpacked With A Powerful Processor And a Camera with 20 MP cam. Thanq Smartprix.. i Love smartprix updating the price details through mail,which products click the price alert so dicrease or increse sending through mail ..